2. Saute onion and green pepper in butter until soft, remove from pan. 3. Add hamburger to pan and cook until browned. 4. Add rest of ingredients except tortillas and cheese. 5. Heat over medium heat until heat through. 6. Coat an 11"x7" pan with non-stick cooking spray. 7. Cut tortillas into 1/2" strips. 8. Layer 1/2 the tortilla strips on the bottom of the pan. Then layer with 1/2 of the meat mixture. 9. Repeat tortilla layer and top with the rest of the meat mixture. 10. Cover with shredded cheese. 11. Bake in a 325 degree oven for 30 minutes. 12. 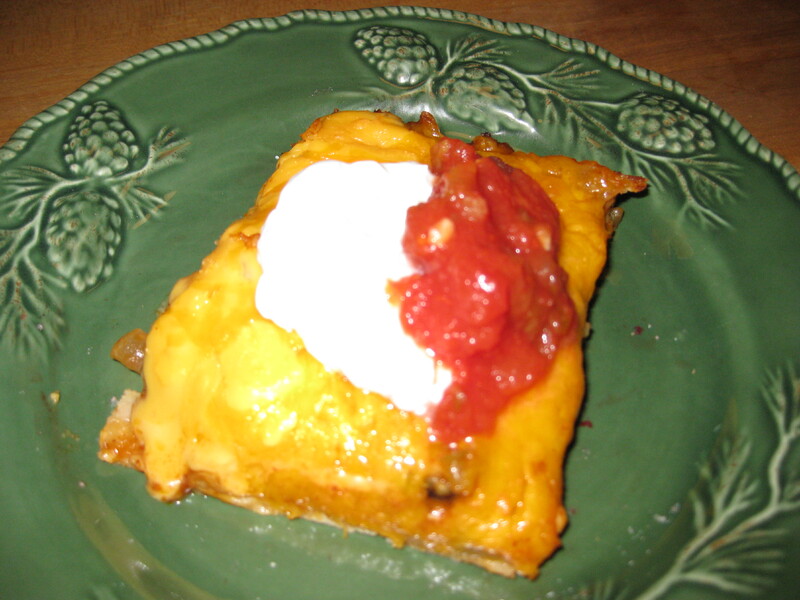 Serve with salsa, sour cream, and black olives.